Eighth graders may not be eligible to vote, but that doesn’t mean they shouldn’t be engaged in the upcoming presidential election. In that spirit, teachers from Mance Park Middle School and the Political Science Junior Fellows formed a unique partnership last week: teaching “The Basics of Presidential Elections” to more than 400 Mance Park eighth graders. 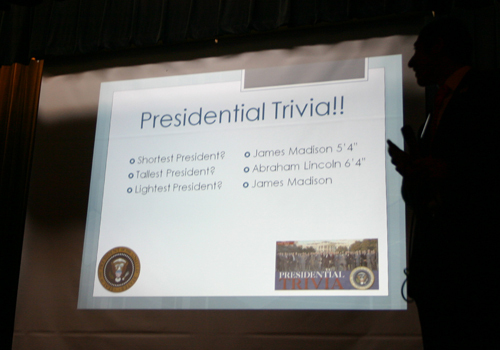 The students proved an impressive lot, according to junior fellows adviser Mike Yawn, adding that they aced an introductory quiz, with quick answers to questions about presidential trivia, such as “Who was the tallest president?” (Abe Lincoln); “Who was youngest president?” (Teddy Roosevelt); and “Who was the heaviest president?” (William Howard Taft). Students who correctly answered questions were given presidential dollar coins courtesy of the junior fellows. Things got tougher, however, when topics such as the Electoral College were addressed. “Even many adults aren’t aware that candidates must receive 270 electoral votes to win the presidency,” Yawn said, adding that with the outcome in many states all but certain, the 2012 election will largely be determined by the outcome in approximately 10 key states. 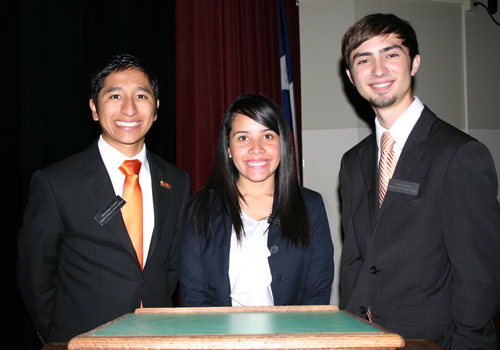 This year’s election was the hot topic of the presentation, and the students appeared well versed on the candidates. If a show of hands was an accurate indication, a solid majority appeared to support President Barack Obama, according to Yawn. On the Junior Fellows side, members of both parties presented.